Growing up, there was never any question that an amazing meal would be awaiting us at the end of each day when we got home from school. It could have been as simple as meatloaf or as fancy as rack of lamb. Whatever it was, though, it was full of great flavor; Mom’s enjoyment of cooking and unending love of her family of five towering men was evident. I don't think any of us took Mom's cooking for granted and, as I have mentioned, all my brothers are good cooks now. I think we all came to expect good food and, if we wanted that to continue, we had to do something about it. That said, I was the first who took to cooking, back then in my early teen years. Mom and I shared a love looking for recipes, paging through Gourmet Magazine, watching cooking shows (the early days of Julia Child, the Galloping Gourmet), and spending time together in the kitchen. She took some cooking classes here and there, strove to make each of us feel very special and loved by making us wonderful meals. 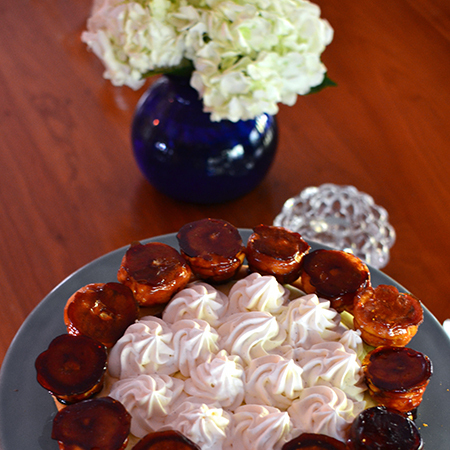 Perhaps because she knew I would appreciate it, one year she made me a Gâteau Saint-Honoré for my birthday. 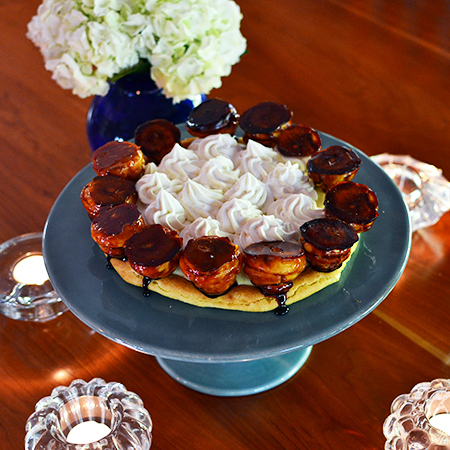 What teen wouldn’t want an exquisite French pastry for their birthday? I have wanted to make a Gâteau St. Honoré since that birthday. Today is Our Friend Barbara's (“OFB”) 60th birthday, thus, the day I will make it. Saint Honoré was the patron saint of bakers and pastry chefs. I hope he is with me in the kitchen today! 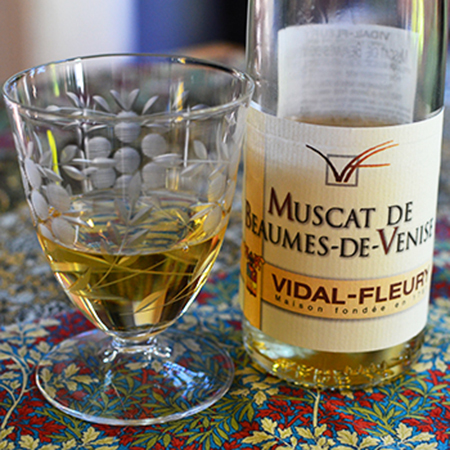 Connie, next door, is having us to dinner and I am bringing the gâteau and a bottle of Muscat de Beaumes-de-Venise from Vidal-Fleury. It is a lovely wine that will help cut through the cream. You can read more about the wine pairing on the Provence WineZine. As always, what you put into your cake will make all the difference when you taste it. If you can't make your own puff pastry, which I understand, make sure to use an all-butter pastry. 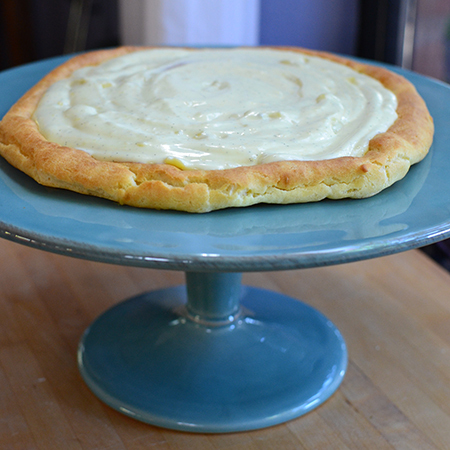 Using fresh organic eggs and cream will also make a huge difference in this delicately-flavored cake. After dinner notes: This was quite a project and, in making it, I gained even more of an appreciation for what Mom did for me that special year! I got several small but painful burns from the caramel, Markipeida got a puncture wound in his thumb from a shard of glass-like, hardened caramel (just desserts for nibbling while I cooked), and I learned that tempering the custard is extremely important, lest you end up with sweet and vanilla-scented scrambled eggs! On the lighter side, below the recipe are some pages from a book Mom used to use to make us birthday cakes when we were very little. What a difference between them and the Gâteau Saint-Honoré, although the love she put into them was always the same. As we head into the holiday season, consider this beautiful gâteau for your table. It is sure to delight! Roll out pastry to 1/8-inch thick. 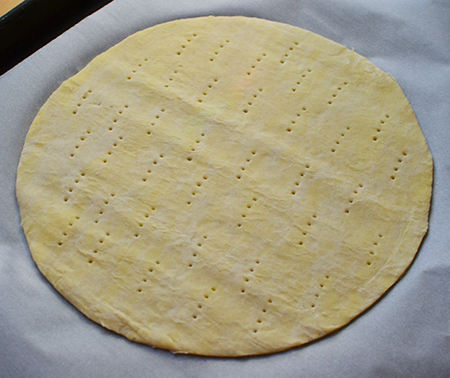 Cut out an 8-inch pastry circle; transfer to a parchment paper-lined sheet pan, and prick all over with a fork. Cover and refrigerate. Heat oven to 425°F. Bring 1/2 tablespoon sugar, 1/4 cup milk, butter, salt, and 1/4 cup water to a boil in a small pot. Add 1/2 cup flour and cook, stirring, until it forms into a dough ball, about 20 seconds. 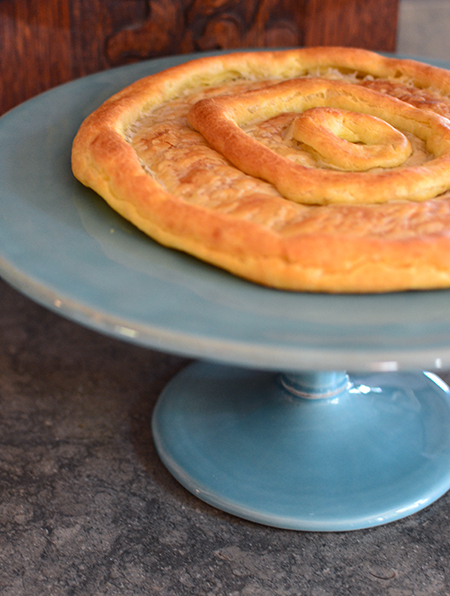 Transfer dough to a bowl. Add whole eggs, one at time, while beating with an electric mixer; continue beating until dough is smooth and holds a soft peak. 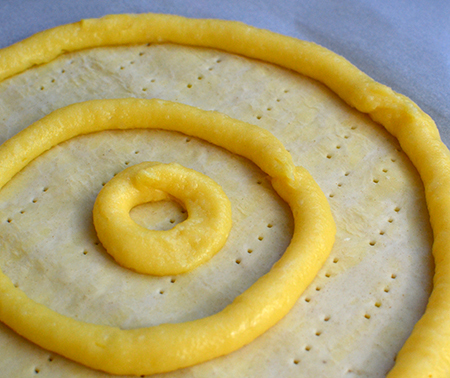 Transfer dough to a pastry bag fitted with a 3/8-inch round tip and pipe 3 circles onto the chilled pastry circle: one along the outer edge, one around the middle, and one in the center. 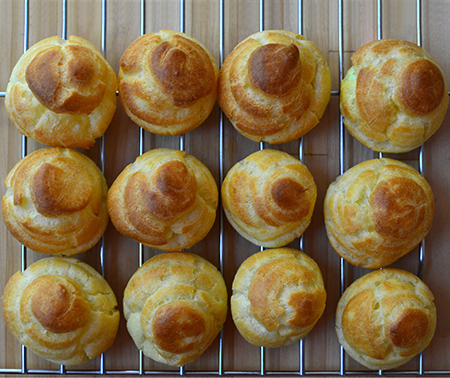 On the same baking sheet, arranged around the pastry circle, pipe remaining dough into thirteen 1-inch-wide puffs. Press down the pointy tops with a moist fingertip. Bake pastry circle and puffs until beginning to brown, about 12 minutes. 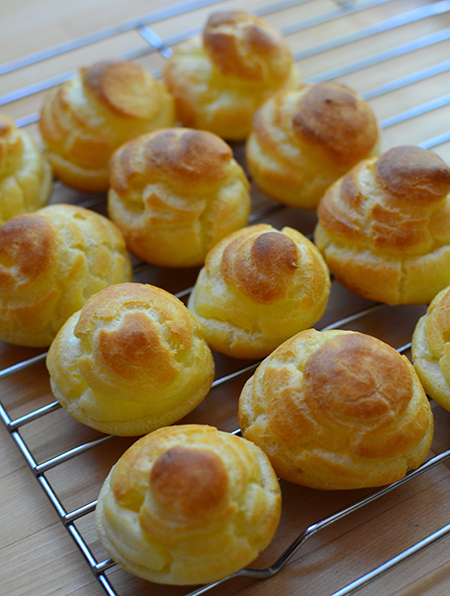 Reduce heat to 325°F; bake until dry and golden – 6 minutes for puffs and 10 minutes for pastry. 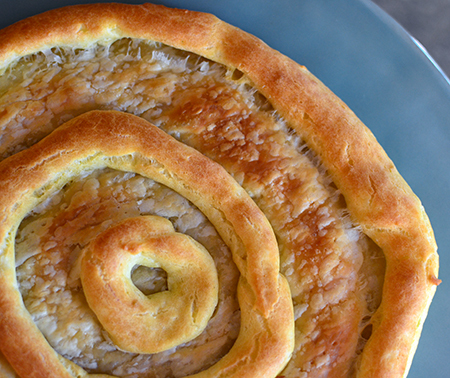 Let the pastry circle and puffs cool. Heat remaining milk, half the vanilla bean seeds, and 4 tablespoons sugar in a small pot over medium heat until it starts to bubble around the edges. Meanwhile, beat together egg yolks and 2 tablespoons sugar in a medium bowl until pale and thick; sift in remaining flour and cornstarch and whisk to combine. Slowly drizzle in hot milk mixture while whisking constantly. Cook 8 to 10 minutes over medium-low heat until very thick; this is the pastry cream. 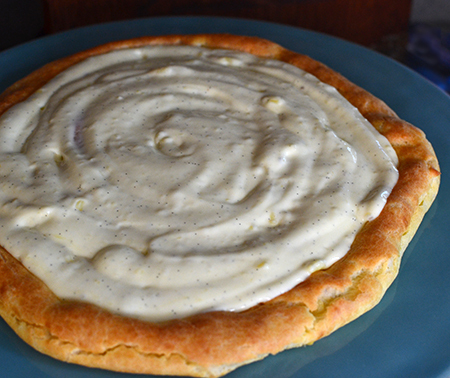 Place a circle of parchment directly on the surface of the pastry cream and chill. Beat remaining vanilla bean and heavy cream to soft peaks in a large bowl. Add confectioner’s sugar; beat to stiff peaks. Transfer 2 cups whipped cream to a bowl, cover, and reserve in the refrigerator. Fold remaining whipped cream into the chilled pastry cream in two batches. Transfer the cream mixture to a pastry bag fitted with a very small, round tip. Poke bottom of each pastry puff once with a toothpick to make a small hole; pipe cream mixture into each puff to fill. 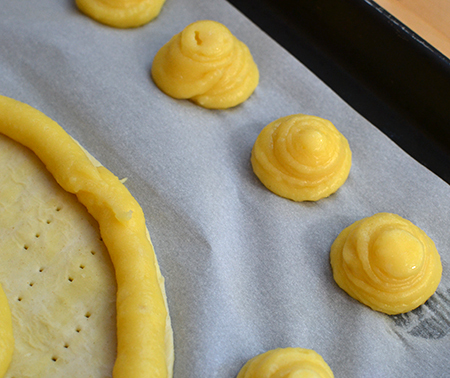 Pipe the remaining cream onto the pastry, leaving the outer ring exposed, and chill. Grease a sheet pan with the canola oil. Bring remaining sugar and ½ cup water to a boil in a small pot over medium heat. Cook, without stirring, until golden brown. Plunge the pot into cold water to stop the cooking, being careful not to get water in the pot. Working with metal tongs, quickly dip each puff into the caramel to coat all over; allow caramel to drip off the puff, then transfer to the sheet pan, puffed side up. Let harden. Reheat caramel, then dip the end of each puff, puffed side down, briefly into the caramel and adhere them to the outer ring of the pastry circle, pressing them down to ensure that they stick. Transfer reserved whipped cream to a pastry bag fitted with a large star tip; pipe cream onto center of pastry in stars. Chill until ready to serve. 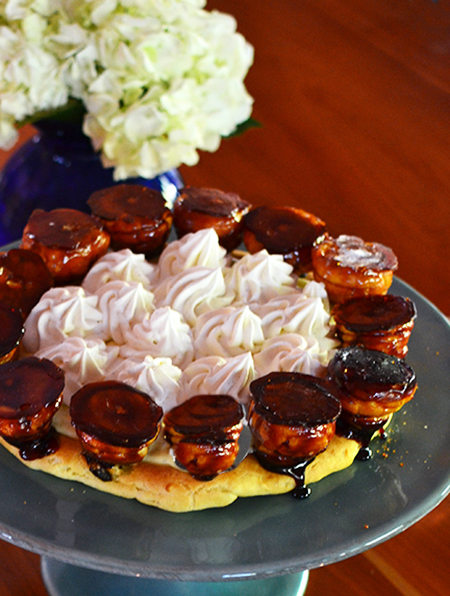 Oh my, this is David's very favorite and his 70th birthday is in January - have never tried making it. Hmmm maybe. As always the story is as special as the food. Where on earth did David have one of these cakes? Was it in France? It really isn't hard, Jill, but it will take a good part of your day! Glad you enjoyed the post! Actually got it at Macy's The Cellar Food Hall in Herald Square for his 30th birthday when we lived in NYC. that one had two layers of pastry, puffs and cream. took us three days ot eat it but was good to the last bite. Love the pictures - I have a Betty Crocker from 1968 (when we got married) that has similar - too cute - actually made some years and years ago. I have to check out the '68 Betty Crocker! Discussing the cake and their two sons, I am sure. Beautiful, David: both the cake and the story! 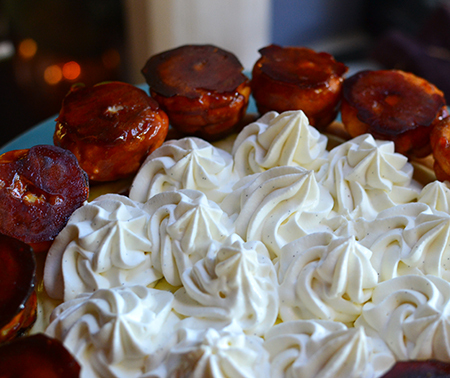 It does seem to be quite an endeavor, which is probably why you've never made it until now, and it's still on my list (along with a croquembouche)! Why can we not have 48 hour days? Wait, I take that back--I'm sure we'd still fill 42 of those hours and be twice as tired, haha! Christina - it is hard enough remaining pudgy and not crossing the line to obese! If I had 42 hours available to cook, I would need to be measured in square miles! so beautiful! you are a talented baker! Thanks, Mimi! What a lovely compliment! Hi David, What a decadent dessert! Very special indeed, Your mom sounds like a wonderful person and a fabulous cook. Love your stories. Thanks, Cheri - whenever I cook I think of my mother. Kind of like she is with me all the time! Thanks, dear Andrea! The reviews we, indeed, pretty good! I can't wait to make this cake! My mother, too, loved cooking and always made a special cake when birthdays rolled around. I think we had that "cut-up Cake" book. I remember cakes in the shape of Huckleberry Hound, Yogi Bear,Charlie Brown, and Snoopy with particular fondness. Of course, I would love to have this cake with the Beaumes-de-Venise! I love the idea of a Yogi Bear cake! BooBoo, too... You really need to try this - and I know you will love it with the muscat! 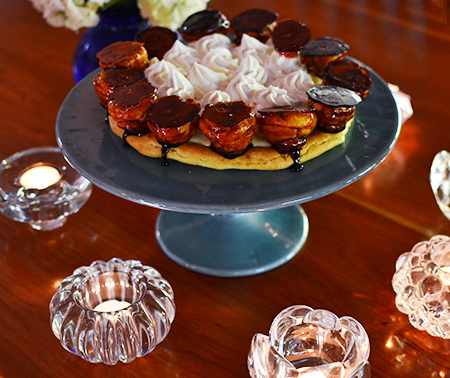 Such nice memories of your mom, and a truly stunning dessert. A work of art! Thanks, Valentine - it was really fun to make, and always fun to think of my Mom! What a lovely cake, your friend must have appreciated the hard work that went into making it when she got to enjoy a piece of it. I know your mother would be very proud of your endeavor. Karen - I felt like she was with me the entire time I was making it! Thanks, Petra! I am very intrigued by your blog name - I need to come over and check it out! I can see where you got your love of great food from! You are such a good friend to do something this complex for a birthday cake! Yes, Inger,Barb is a wonderful friend and one would only make this cake for someone as wonderful as she! I've been stabbed with a shard of toffee once before, so I share Marks discomfort! And now David, this cake, such a thing of beauty! The texture and flavour would be incredible - something I'd savour with every mouthful. Mark appreciates your sympathy! It is really a great combination of flavors and textures! Now, when you make it, how will you change/improve it?